My wife, Maria Teicher, and I founded and run a 501(c)(3) arts non-profit based in Philadelphia. Among our objectives is one to support emerging and mid-career artists living or exhibiting in the Philadelphia area. As such, our online presence is focused on promoting artists’ work as well as sharing tips and tricks; and at times giving some much needed motivation and encouragement. After seeing that she posted this I went to our bookshelf to leaf through a specific book: Like Shaking Hands With God – A Conversation About Writing, by Kurt Vonnegut and Lee Stringer. The book, published by Seven Stories, is a series of interviews between Vonnegut, a veteran writer of several novels at the time of the interviews, and Stringer, a new novelist who had recently published his first book. Like Shaking Hands With God is a book in which Vonnegut gives honest and razor-sharp insight to Stringer about creativity, life, and humanity. This book was a great one for me, as Kurt Vonnegut is one of my favorite writers, and I myself am a member of the creative community (musician, writer, etc). All of John Bogle’s books are tied to the financial world. While I am not a financial-book aficionado, this introduction was such a beautiful welcoming to what would become my favorite book by him. John Bogle is the founder and former CEO of The Vanguard Group, the company I have worked for since 2006. Though no longer CEO, he still is the head of the Bogle Financial Market Research Center within Vanguard. He still publishes books, interviews regularly, and continues to make an intimidatingly large impact on the financial arena. 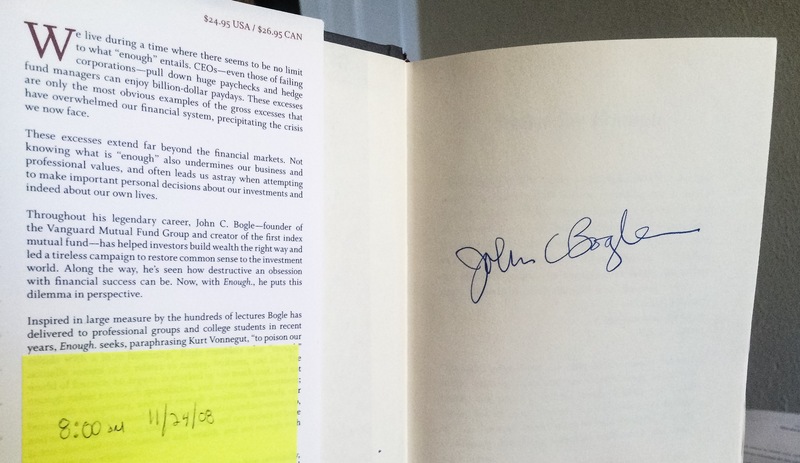 Among the perks of Mr. Bogle continuing to be on Vanguard’s site is occasionally spotting him walking around campus or in the cafeteria, being able to receive copies of his book and to have him autograph it, and to be able to have conversations with him. On November 24, 2008 I received my copy of Enough. I was able to briefly meet Mr. Bogle to obtain his signature on my copy. In doing so, we struck up an extremely short conversation, in which he asked me what I do outside of work. I said that I was a musician and had recently returned from a tour. I had stated it in a way that I recall feeling somewhat ashamed – akin to the way a teenager might feel if they said to their parents that they “want to be a musician” when they grow up. His response caught me off guard, and stuck with me over these years. He said that being a musician is something I should be very proud of, and that I was contributing to society through culture, and how that was extremely important. Our interaction likely only lasted 30-40 seconds, but it stuck with me. For the hours afterward, I wasn’t the business professional who played music on the side – I was a musician who played an important role in culture. Encouragement goes a long way, whether it’s an empowering quote or meme, or quick conversation in passing. 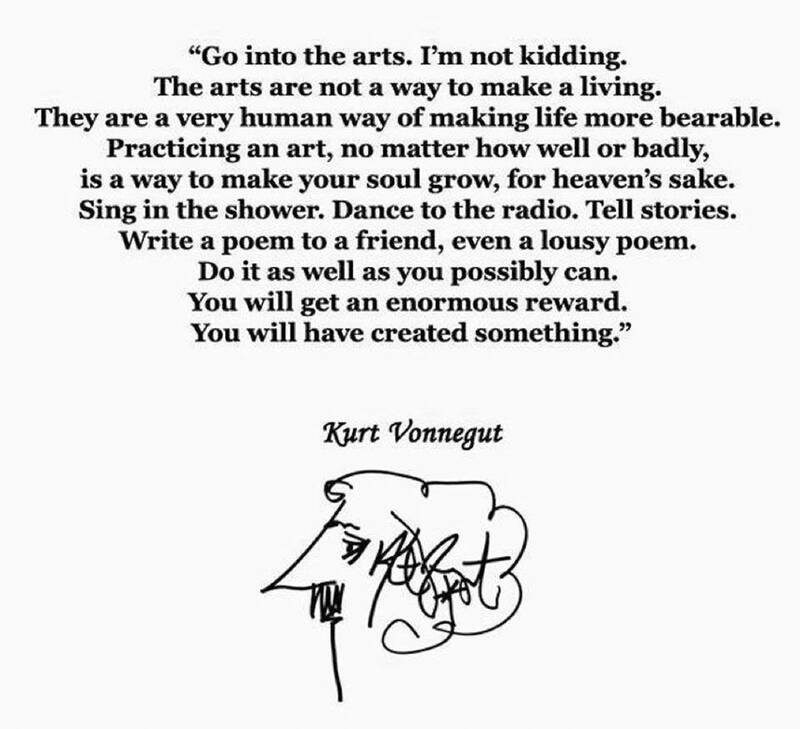 Granted, I understand that I will not be the biggest musician of all time, but the act of creating is immensely rewarding itself; and in a world where creatives are continuously told to ‘grow up and get a job’, hearing Mr. Bogle’s feedback had the same positive and uplifting response as the Kurt Vonnegut quote Maria posted on our page.